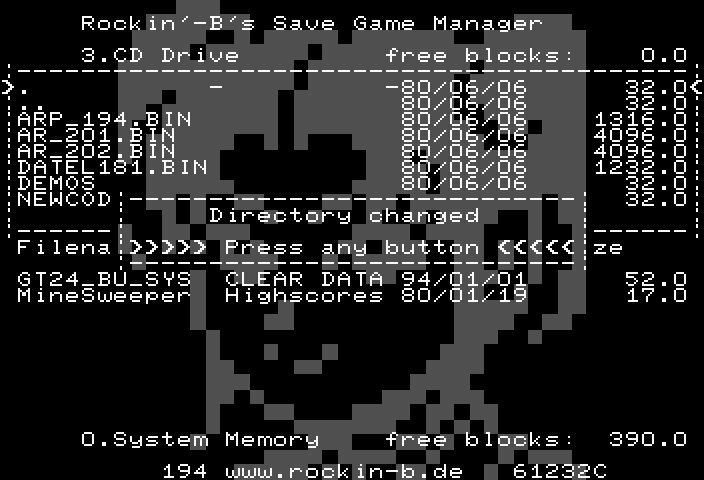 Most useful utility for gamers on SEGA Saturn! 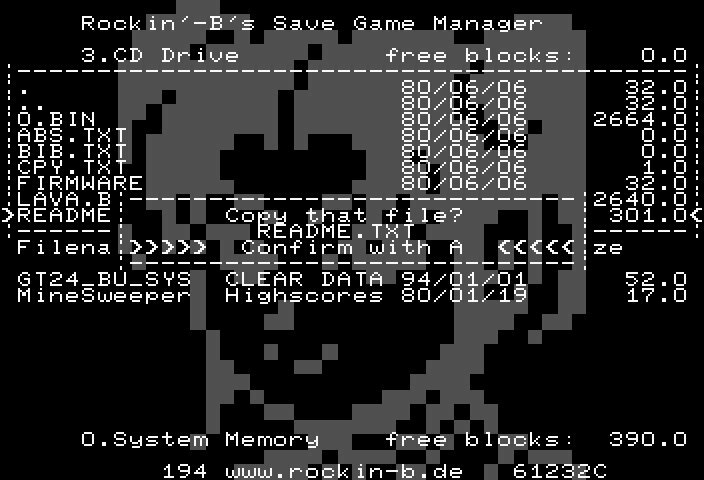 The first screen when you run the SGM. You need to be told how to use it: most common used features are attached to buttons A,B,C and Y,Z while directory browsing and stuff is done with the D-PAD, L,R and X. 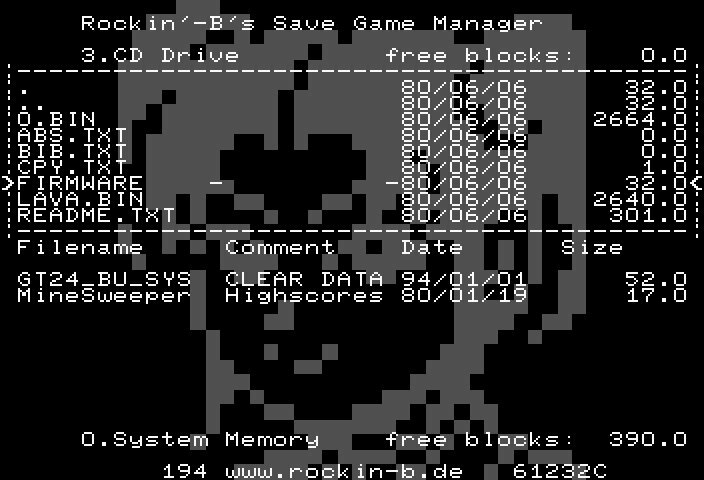 The menu (2nd screen) provides access to all features of the SGM, you can always open or close it by pressing START. This is what it looks like where the action takes place. You see two different devices, one of them is highlighted and thus the active source drive. There are two device slots (on top and bottom half of screen) and by pressing LEFT/RIGHT you can change the device shown in the currently active device slot. Toggle the active device slot with X. Copy all files you want to be compressed into any writable device. 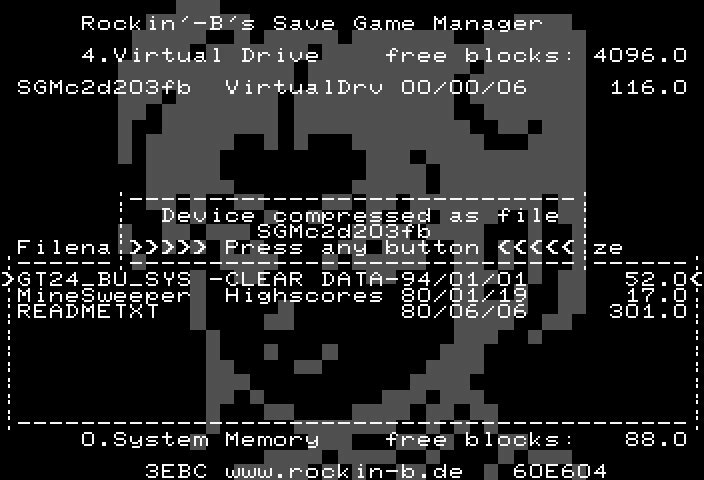 Other than shown in this image, it should rather be a Virtual Drive in general, because they are almost unlimited in size and also much faster in operation. 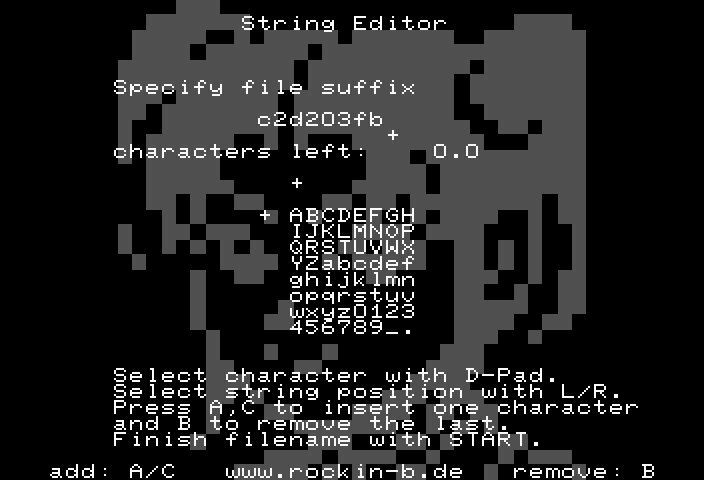 After confirming with Z and after compression is done, you can specify that part of the filename that follows after "SGM". 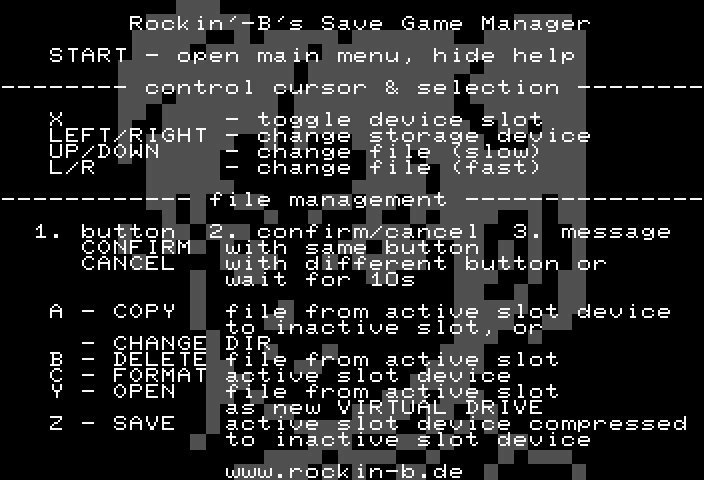 The compressed device appears as a file in the inactive device slot. It's much smaller. Then press START to open up the menu, select "flash Action Replay", press A and confirm again. 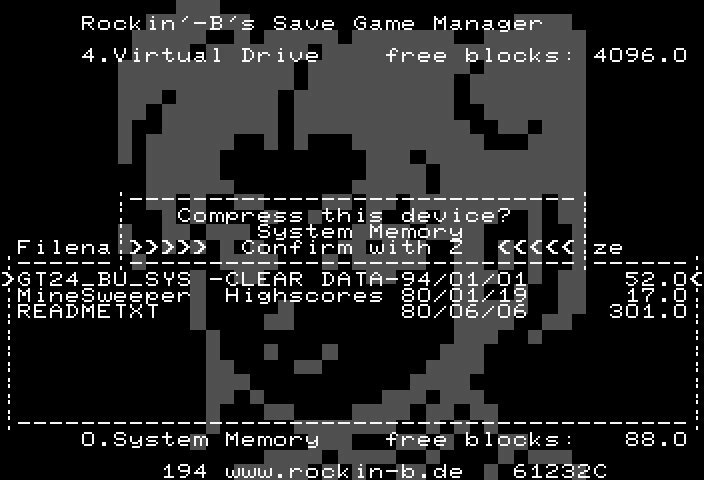 The SGM will check if it's a valid firmware (in this case, LAVA.BIN would fail, as it's an image and no firmware). Then the arflash program from ExCyber is started where you can initiate the flash by pressing START+A+B+C together. Note that it'll take a while until it starts flashing. 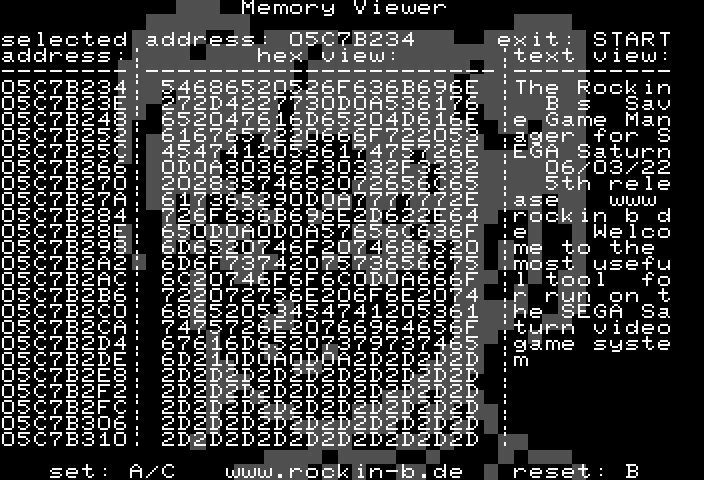 And by the way: the memory viewer is also used for typing base 64 encoded files from screen.